I’m as hopelessly plugged in as the next person, but every so often I dream of giving up Twitter and Amazon Prime for good, and getting lost in a tropical rainforest. My love affair with the tropics began at age 19, when I jetted off to Ecuador for a summer paid for with my saved-up waitressing tips. I was pretty into the outdoors, a little into science, and had just taken a year-long Spanish class. 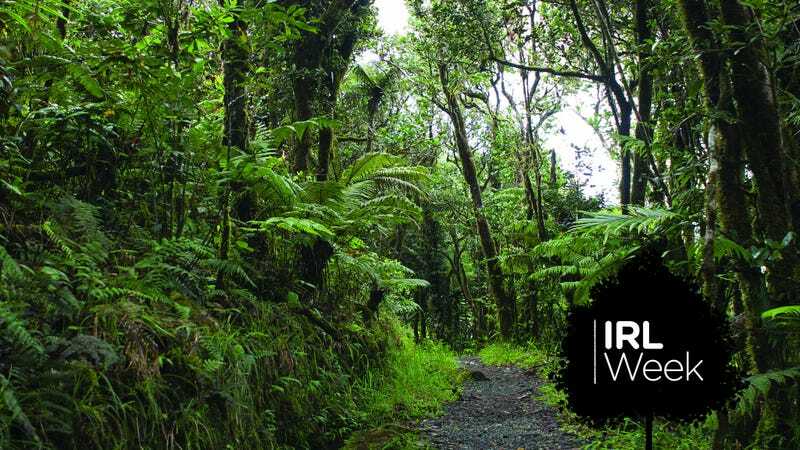 An Ecuadorean conservation foundation’s call for volunteers to help with ecological restoration projects in a remote patch of coastal rainforest was irresistible, especially since room and board were covered. I wasn’t quite aware that “room” meant a mattress in a hut a three hour hike upriver from the nearest village (BYO mosquito net) or that “board” would consist almost entirely of rice and beans, plus whatever fruit we could scavenge from the forest and whatever crustaceans we could catch in the river with our machetes (very few, in my case). But I was game for an adventure, and I got one. Between grueling days spent clearing and constructing our basecamp (including digging our own latrine on my first week), and relaxing evenings spent playing cards in our open-air kitchen as the skies erupted with rain, I learned there are ups and downs to jungle life. Speaking of life, the biggest draw is that there’s so damn much of it. From getting lulled asleep by the cacophonous clamor of insects, birds, and frogs, to encountering endless new varieties of plants each day, to spying a cluster of colorful birds or a monkey darting through the treetops, the vivacity of it all is overwhelming and thrilling. Of course, the profusion of living beings does make it a bit crowded, and you’re going to have to get used to sharing your personal space with everything from black flies that bite every inch of exposed skin to ants that lay siege to any food left unwrapped to scorpions, tarantulas, and pit vipers whose bites will kill you, a fact I was reminded of every time I decided to walk anywhere after sundown. There’s also the climate, which can best be described as taxing. Hundred-degree days with 100 percent humidity are the norm in the jungle. With no air conditioning to be found, the combination leaves you feeling unclean at all times. If you’re somewhere remote, the best you can do is find a secluded river to cool off in and hope you’re not sharing it with a water-borne parasite. In spite of these various discomforts, the jungle won me over that summer, so much so that I went on to do a PhD in tropical ecology. A dissertation and many hours of lab drudgery were a small price to pay for the privilege of getting to study the ecosystems that so captivated me—although grad school took me to the Luquillo Mountains of Puerto Rico, whose rainforests are as different from Ecuador’s coastal lowlands as Nebraska is from Nantucket. There are fewer venomous dangers, at least. PhD life taught me there’s far more to the rainforest than meets the eye. My research on soil microbes revealed the teeming, invisible ecosystem beneath our feet that works overdrive in the hot, humid tropics to break down the dead and recycle their nutrients for the living. Field courses in geology taught me that much further down, tectonic uplift and weathering collaborate over deep time to create steep and rugged topography that supports diverse gradients of life. Time spent with locals revealed the many ways that rainforests support humans—and the many ways we’ve degraded these marvelous ecosystems. Dipping latex-gloved hands into the toxic waste pools that litter Lago Agrio, Ecuador. That last lesson is one I won’t soon forget, not after my most recent trip to a rainforest several years back. By that point I was a journalist, assigned to write about a grassroots remediation effort underway near Lago Agrio, the Amazonian oil town where Texaco spent more than 25 years drilling for petroleum and dumping billions of gallons of toxic waste in the forests and rivers along the way. In the late 1990s Texaco was bought by Chevron, which has used its vast resources to evade responsibility for this mess for decades. That trip left me angry at how we’ve recklessly poisoned the tropics, and how people lacking money or power are the ones suffering for it. But I was also left more in awe of these forests than ever. Because amidst all the pollution was a profound sense of life’s tenacity, writ in my memory as a dinner plate-sized fungus blooming in toxic sludge; a tree too wide for three grown men to girdle; a community of people who love their land in spite of its many human-inflicted flaws. Some rainforest travelers prefer ayahuasca to reach a higher plane of existence, but the feeling of simply existing in that overflowing cup of life is, in my opinion, the perfect drug. If you have the opportunity to visit a rainforest, I recommend you take it. The heat and bugs are bearable, and even the ugly realities will remind you that there are things in this world worth fighting for.